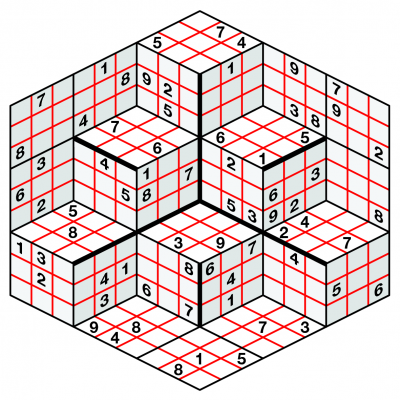 3D Sudoku takes Sudoku to the next dimension, at least in terms of its appearance. 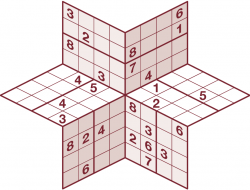 The puzzle solves like a regular Samurai Sudoku, with a range of overlapping grids and regions, except that in 3D Sudoku these constraints are more varied and consist of rows overlapping in one of three different directions. 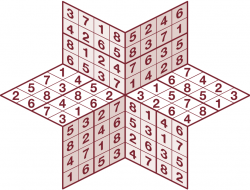 In particular we offer Jumbo 3D Sudoku, as in the samples here, where there a staggering 243 squares to solve - you won't find a larger and more impressive Sudoku variant ready! 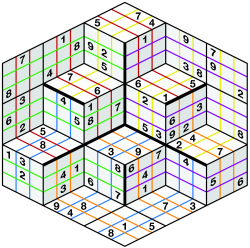 The aim remains simple: just place 1 to 9 once each into every black-lined 3x3 area as well as each of the 54 rows indicated by the coloured lines. 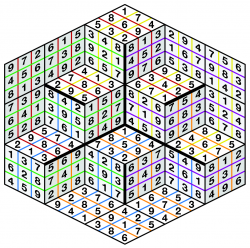 Thick black lines indicate borders where the rows don't continue, so in terms of logic complexity it's exactly the same as a regular Sudoku. 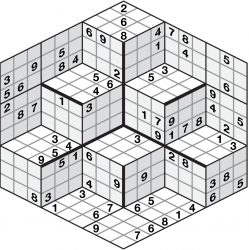 In terms of solving, however, it feels very different and usually the puzzles involve a "chase" around the the grid, which is carefully designed so that nothing connects through the middle and so numbers flow in both directions around the outsides of the puzzle. As with all of our logic puzzles, there is only ever one possible solution. What's more, we guarantee that it can always be reached via reasonable logical deduction, so guessing is never required.